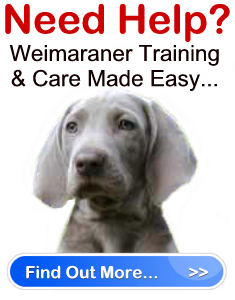 Weimaraner Rescue Discount Offers " "
A Weimaraner rescue, like most dog rescues, is likely owned and operated by a non-profit group of people who volunteer their time to give their support and care to abandoned dogs in need. Therefore, a dog rescue is essentially a charity. Thus, they need all and any help they can get from the public and those directly related to their cause, such as veterinarians. If a dog has been used for breeding prior to being rescued, they are usually sent for Brucellosis testing. If you own a dog and regularly take him to the Vet, you have a good idea of how expensive just a standard Vet bill can be when your dog is healthy. Just imagine how much it costs when the dog requires serious medical care. Because of the high cost, it is not uncommon for a Weimaraner rescue to use a Vet or Vets, who provide them with a discount price. You can offer your support to the Weimaraner rescue by asking your Vet, or the Veterinarians in your area, if they are willing to provide the rescue with a discount for their dogs. If a Vet is willing, offer your support to the Vet by making donations. After all, medical care may be provided for free out of the goodness of ones heart, but medications and medical equipment doesn’t come cheap for anyone. There are many ways you can help. Funds can do plenty for a Weimaraner rescue, but love and care is also a requirement that money can not replace.